Trump’s Islamic State victory lap was also quickly undercut. At the end of the flight to Florida, White House press secretary Sarah Huckabee Sanders entered Air Force One’s press cabin wielding a map. ISIS no longer holds any territory in Syria, she declared, without offering any other details. 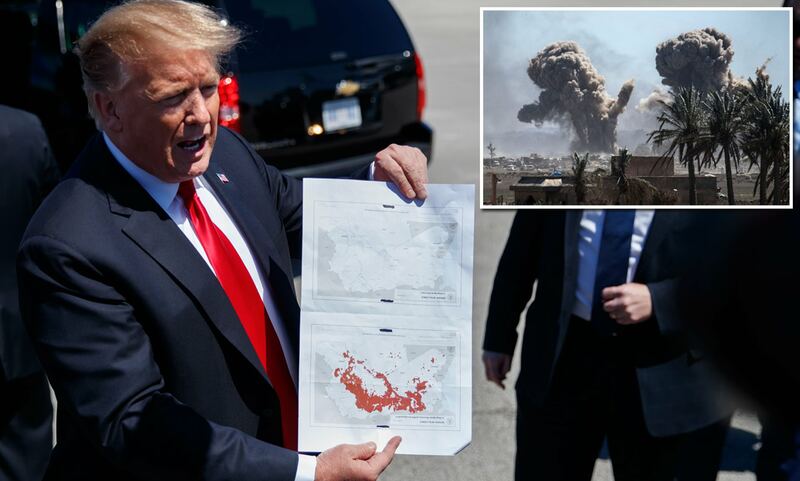 Trump later held up the same map, at one point displaying it upside down, boasting about his success in diminishing the terrorist group. “So here is ISIS on Election Day. Here’s ISIS right now,” he said. The only problem: the graphic didn’t compare ISIS’s current territory to Election Day in 2016. According to photographs captured by reporters, it compared the territory to 2014, undercutting the president’s boast about turning things around immediately after taking office. “You guys can have the map. Congratulations. You’ll spread it around,” Trump told reporters, handing them the document. Sanders quickly snatched up the paper. Aw, Shucks. You Uncovered Our Secret. Trump has veered back and forth on U.S. activity in the country, insisting recently that he wanted the U.S. out of Syria as soon as possible. “After Trump’s first year we have: 1.3 trillion omnibus, no wall, war in Syria. Is Clinton secretly President?” wrote Lucian B. Wintrich, the D.C. bureau chief and White House correspondent for Gateway Pundit.